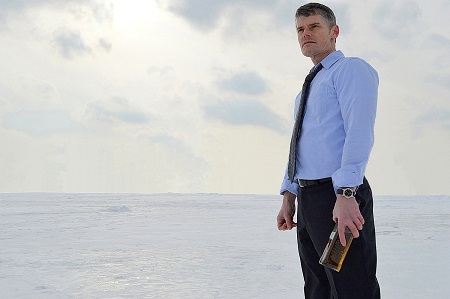 Cold Comfort is a one person show about an Irish man who is drinking alone with his estranged father’s corpse. He knows it’s impossible, but he wants the dead man to speak and answer some questions, primarily why did his mother leave them when he was a child? But Kevin knows the answer already. His father was an alcoholic, and now Kevin is too. He even has his own ex-wife. He is distraught at following in his father’s footsteps but he doesn’t know any other way to live. Fly On The Wall Theatre presents this portrait of a disturbed man at Near Studio on the second floor of Tarragon Theatre. Kevin starts by haranguing the dead body of his “Da”, but then he reaches a part in his diatribe that needs to be addressed to the mother he barely knew. So he sets up a chair to represent her, and later another chair becomes his ex-wife. Kevin doesn’t just speak to these stand-ins and the cadaver though: he invents whole dialogues, with interactions between the imaginary people. As he gets drunker and drunker, his emotions veer wildly from rage to a crazed good humour; but simmering below everything is an obvious well of despair. Actor David Mackett is a powerhouse, steering Kevin very close to madness, taking the audience on a ride through Kevin’s damaged psyche that stays compelling even when the script is a little trite. This is a small production in a small venue, with only the chairs, the coffin and a small table with flowers and a guest book at the back. This conveys the setting well enough and gives Mackett everything he needs, including enough space for his very physical performance. I did lose some of the words near the beginning, due to the accent and dialect and fast-paced speech and slightly drunkenly-slurred pronunciation. But, much like when I read a novel written in dialect, eventually I settled into it and by the time we got to the beating and bloody heart of the matter, I was understanding everything. The tale of an emotionally stunted alcoholic father raising a son who becomes an emotionally stunted alcoholic isn’t particularly fresh, but Cold Comfort is a character study and so it’s all about the performance. I suspect that Macket and director Rod Ceballos have a very good working relationship and this play was an opportunity for their collaborative dynamic to shine. In such a case it’s impossible to tell what parts of the play were direction and what parts acting: it was a cohesive whole. There is no hope for poor Kevin. But I think the future is bright for Macket, Ceballos and Fly On The Wall Theatre.